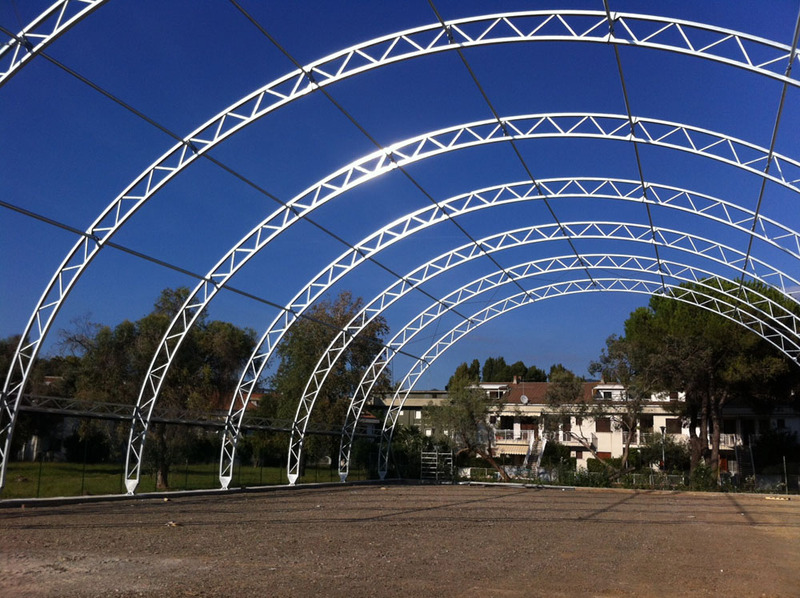 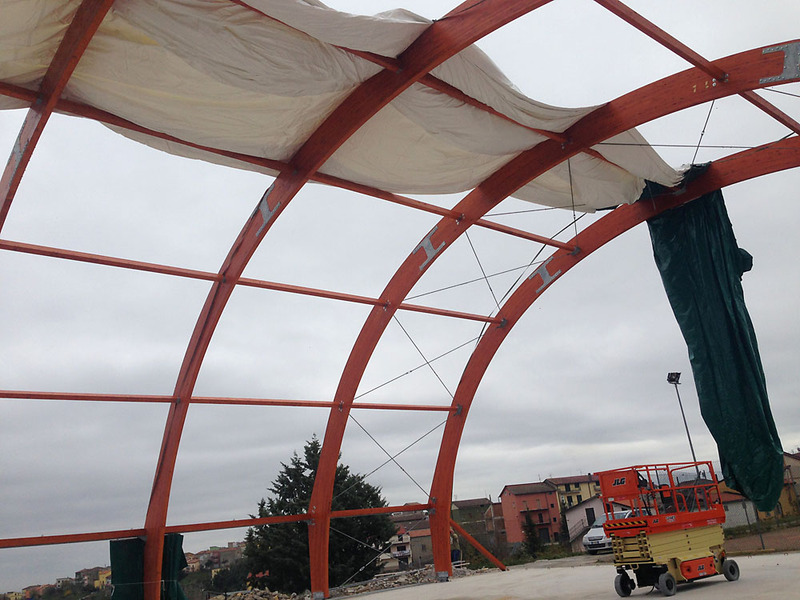 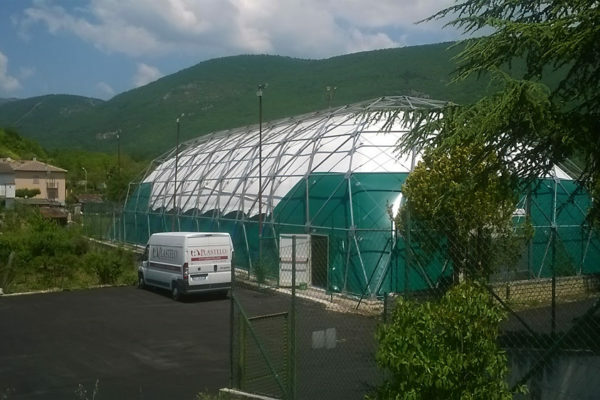 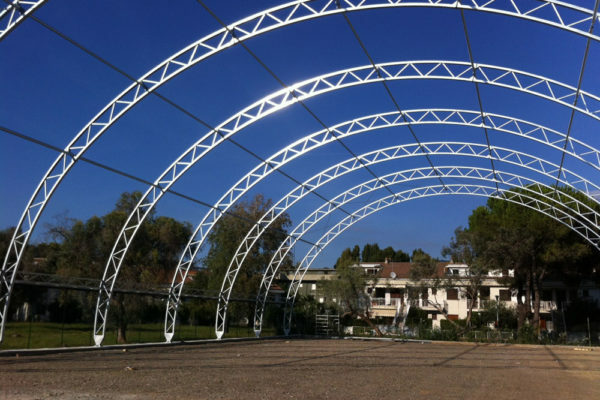 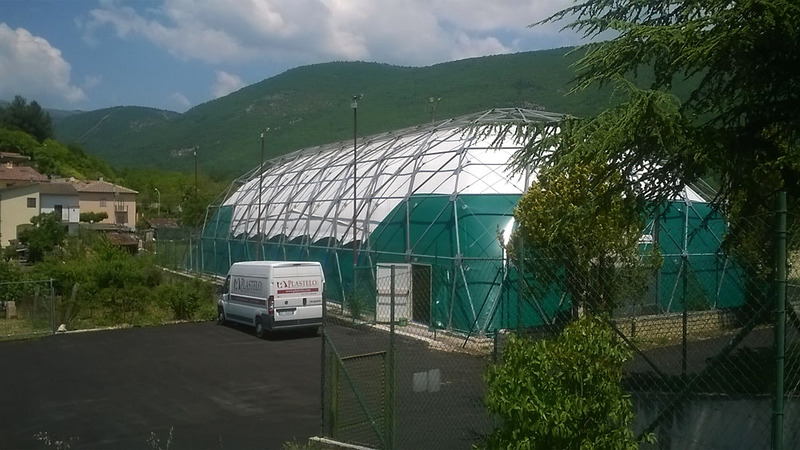 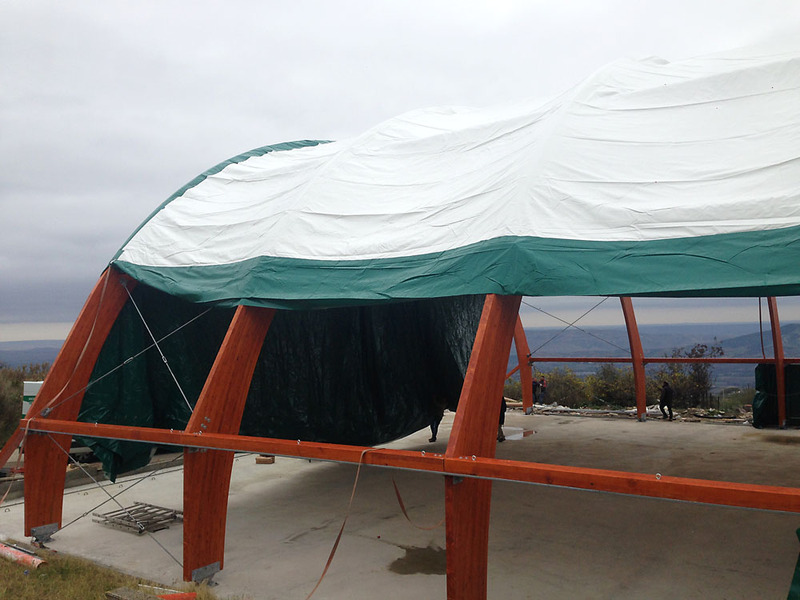 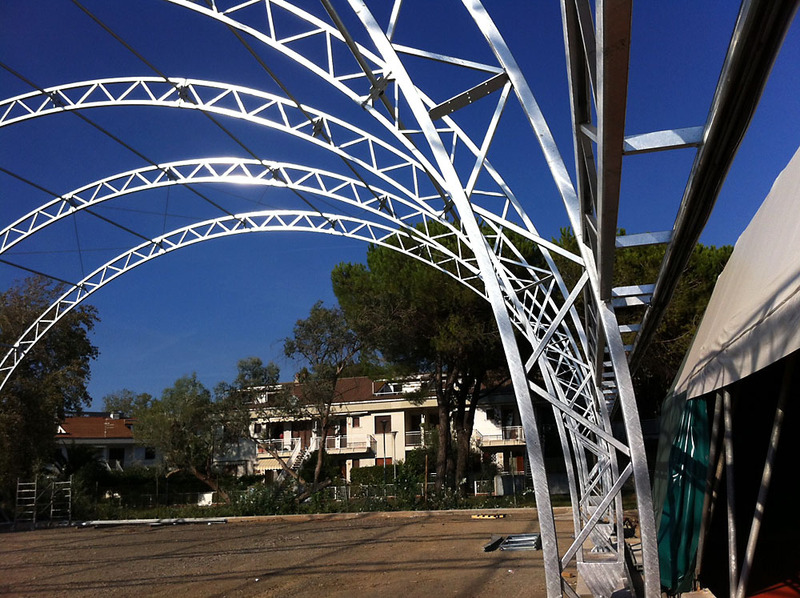 Tensile Structures and Strut Structures in Lamellar Wood and Steel, PVC Membrane Cover. 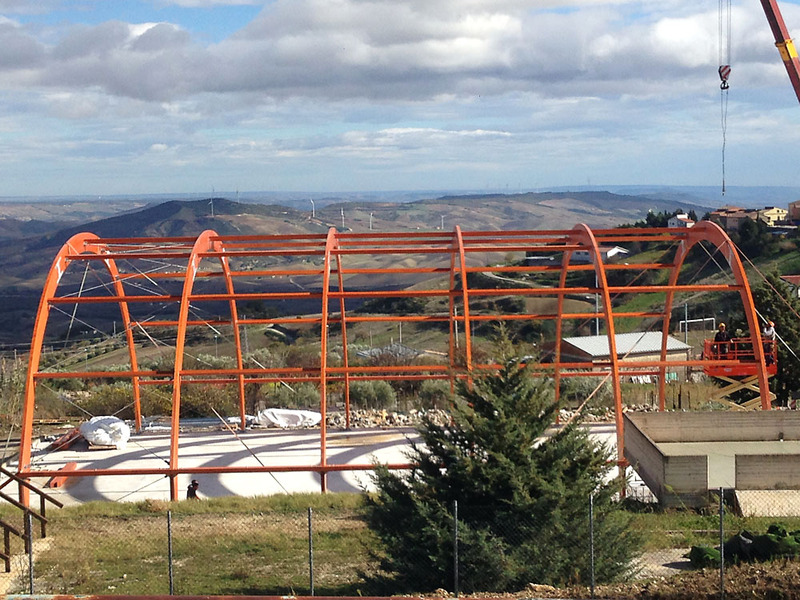 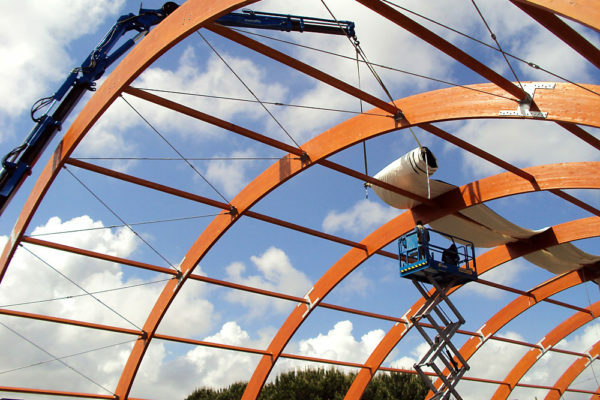 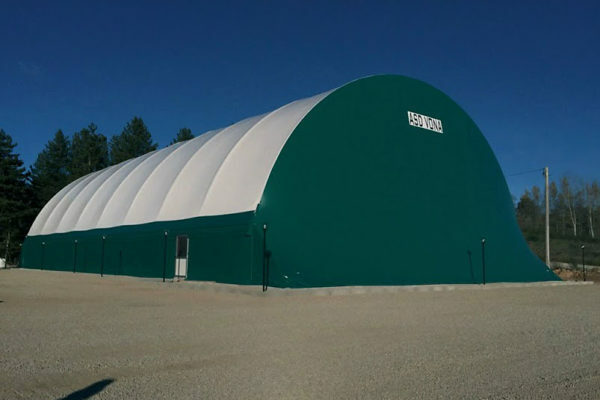 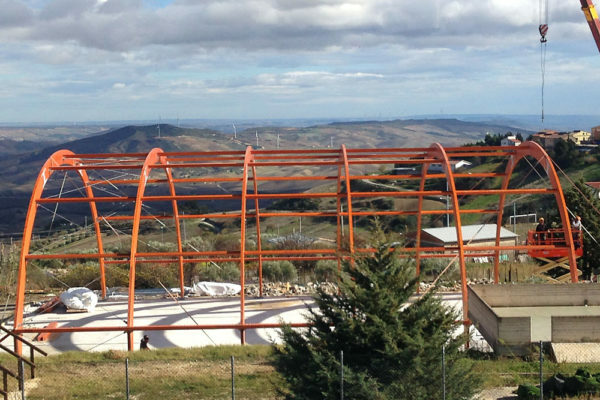 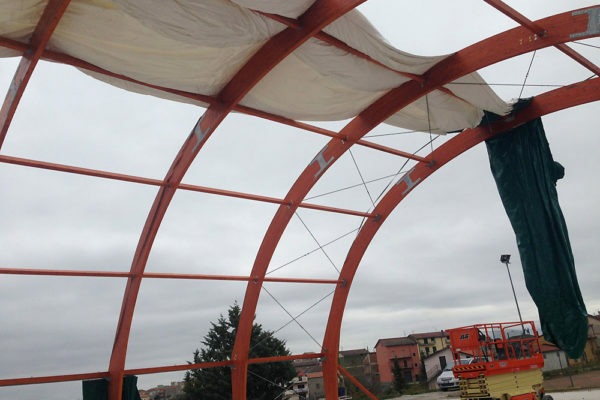 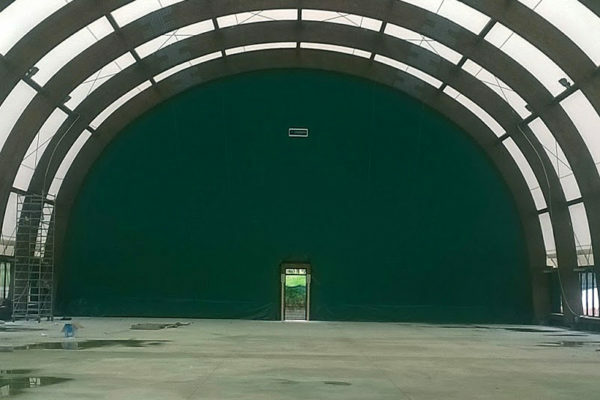 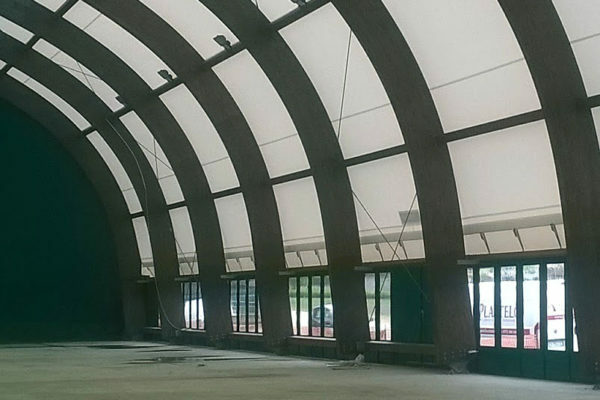 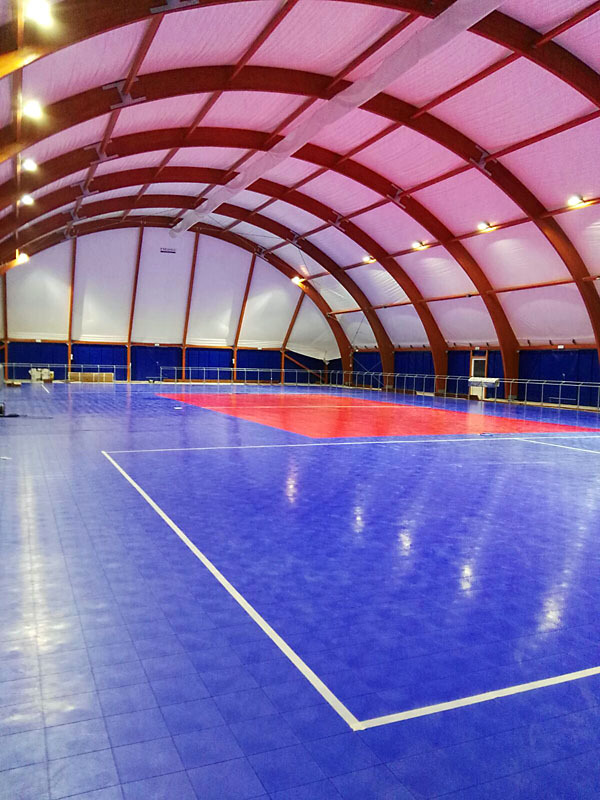 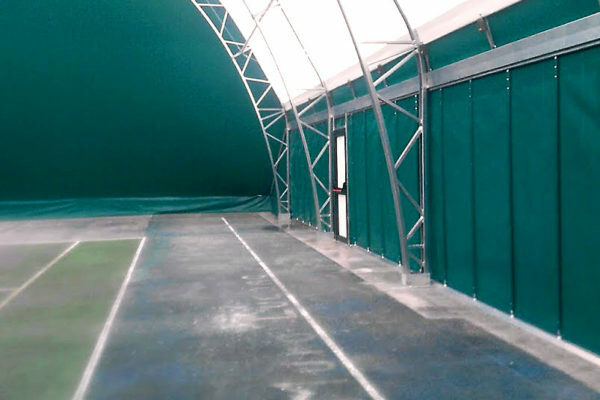 Sports shells made of high strength PVC membrane on laminated wood structure and galvanized steel, designed and built for the installation site. 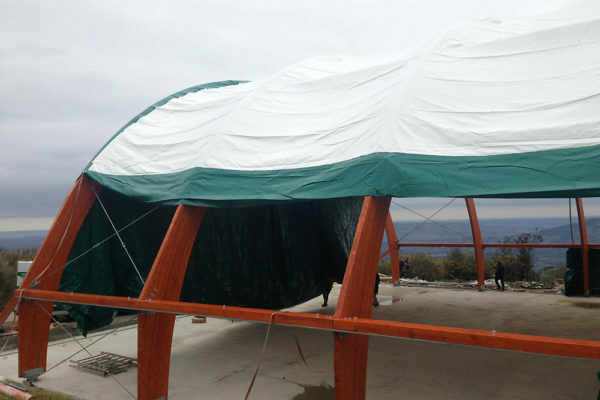 For this type of roofing structures, it must first be said that they are subject to static calculations and foundation works, all determined by the snow / wind stresses that the building zone provides, as required by the “D.M. 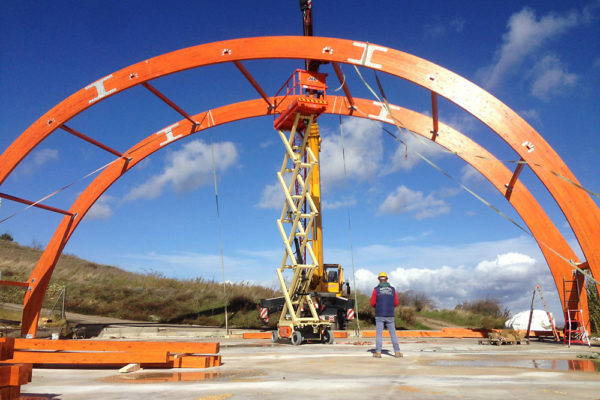 March 18, 1996 – coordinated with the modifications and additions introduced by D.M. 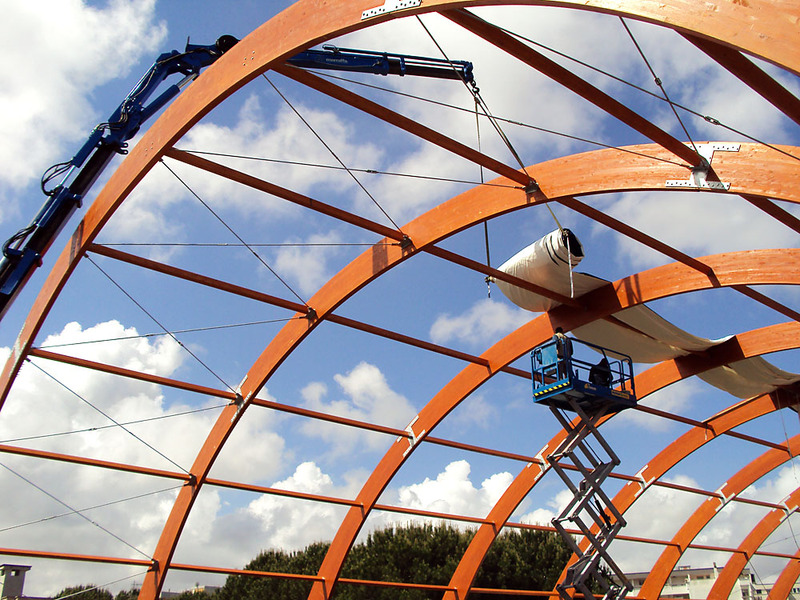 June 6, 2005 “. 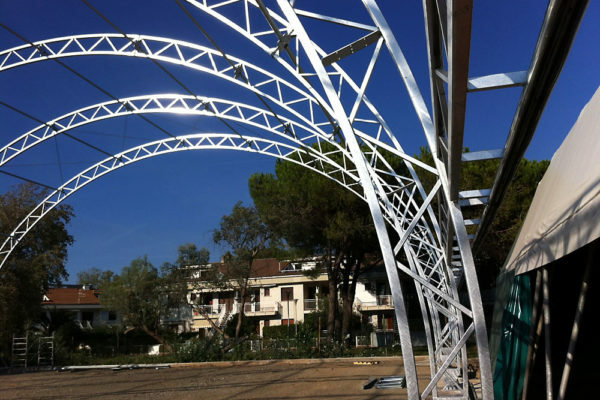 The static calculation is performed with the structure and its “cover”, which directly undergoes the stresses and transmits them to the supporting structure either of lamellar wood or galvanized steel. 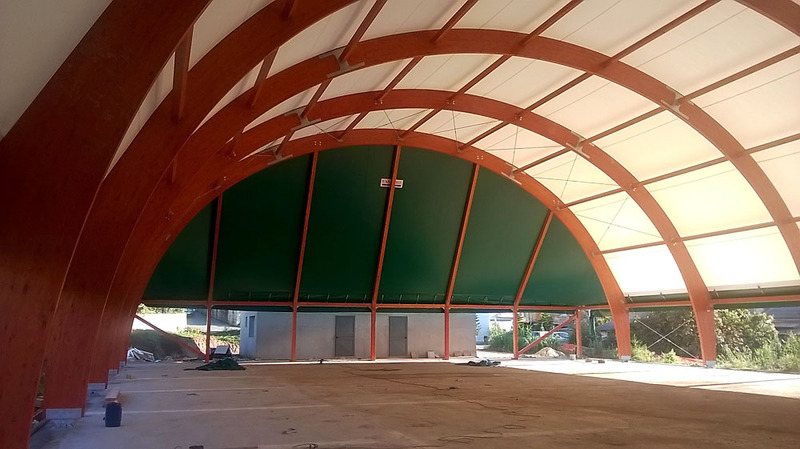 In the first case lamellar wood is used in accordance with the European standards EN 14080 and EN 1194, GL28H for curved and GL24H for straight, gluing with transparent homologated collars and protection with a coat of transparent varnish painted brush. 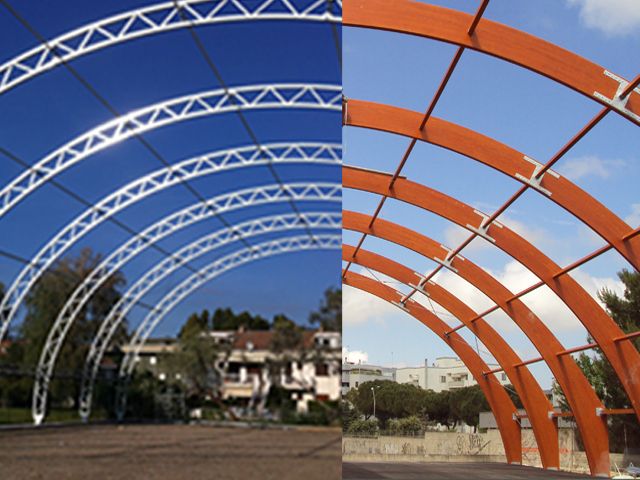 In the second case we use instead light metal structures in S235 o S275 , made with profile and tubular, hot galvanizing process. 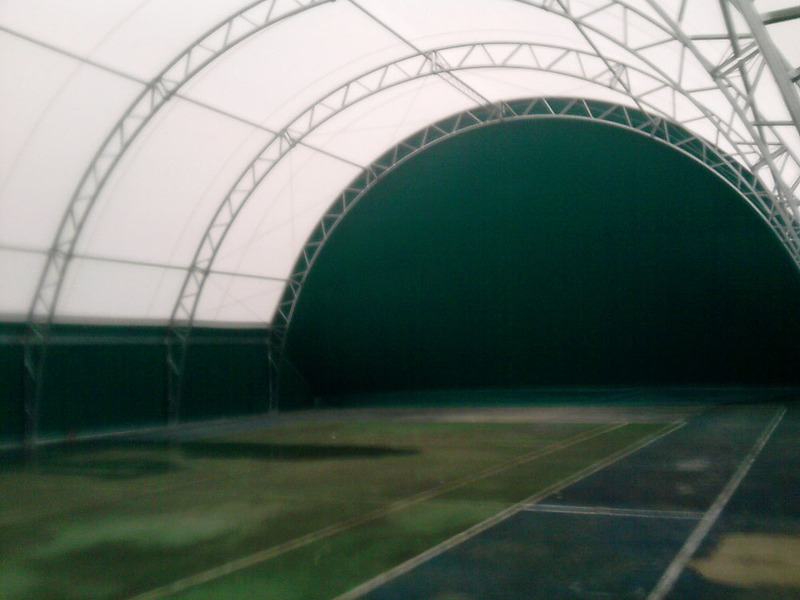 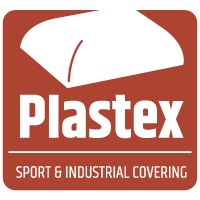 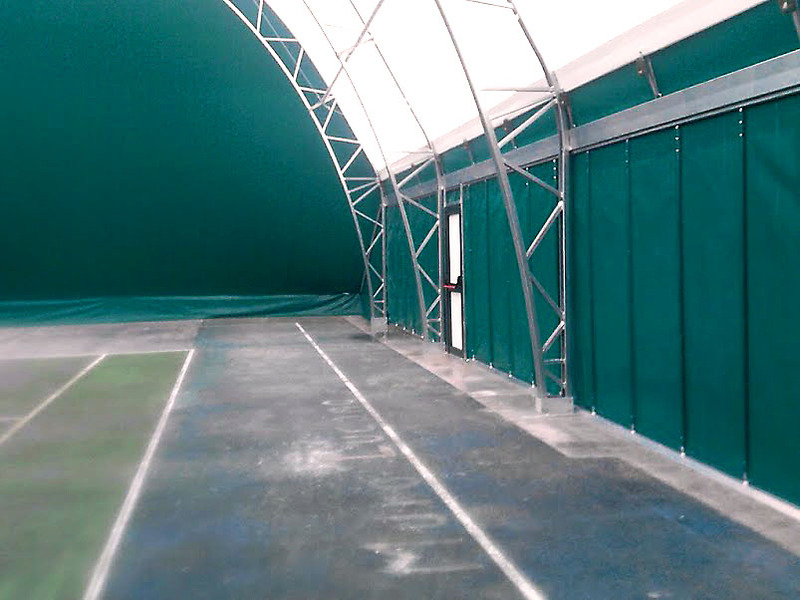 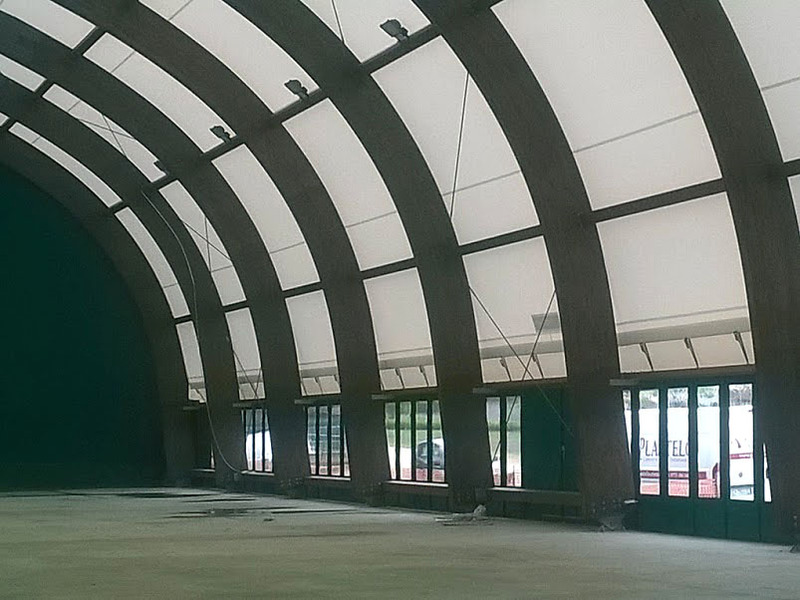 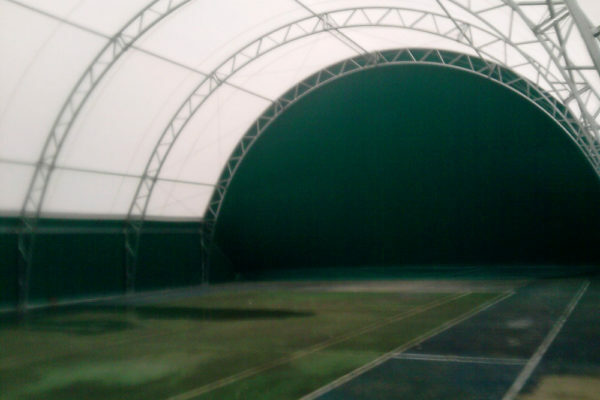 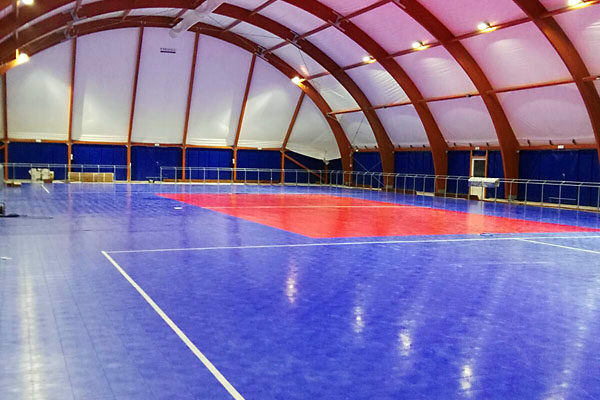 In the majority of case, sports facilities are covered by textile membrane coated on both sides with PVC. 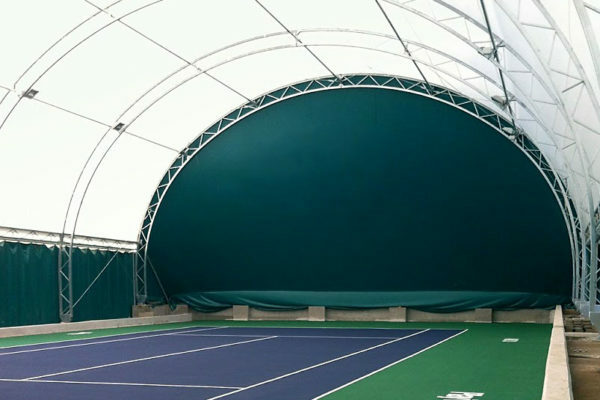 Its most important feature lies in the values of the quality of the fabric and its tensile and tear resistance, because the “work” of the PVC membrane is linked to its elasticity as it must be “tense” to play its role. 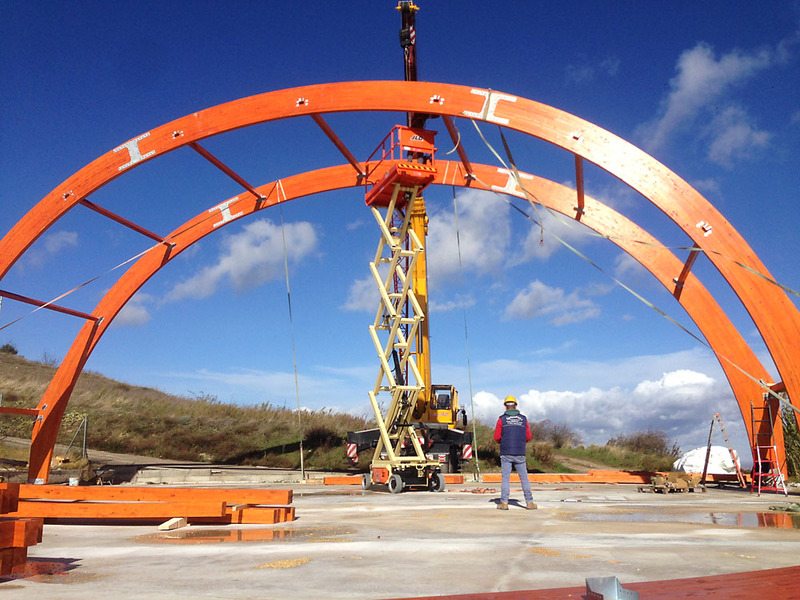 Its weight (expressed in gr/mq) identifies the various types of membranes. 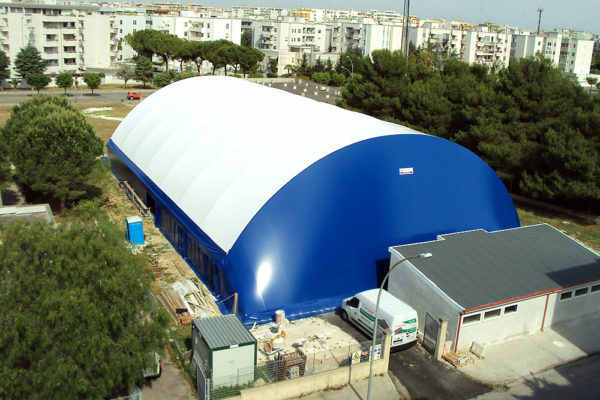 However, it has a “very high” thermal transmittance coefficient which determines two different situations that should be well-valued: heat dispersion in cold days and consequent increased energy/heating consumption and transmission within the radiant sun on hot days resulting in an “oppressive” microclimate. 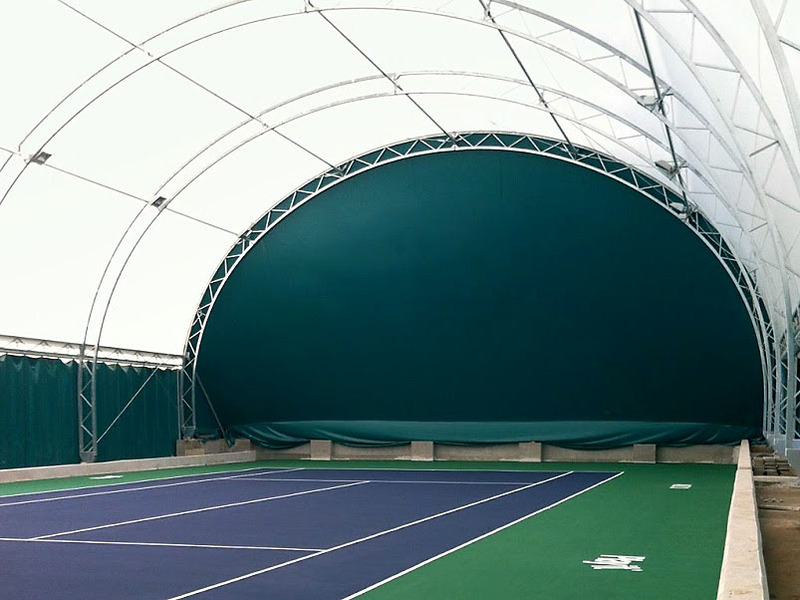 To overcome this kind of problem, is needed a better coverage isolation, inserting a “second membrane” and creating air between the outside and the inside of the membrane. 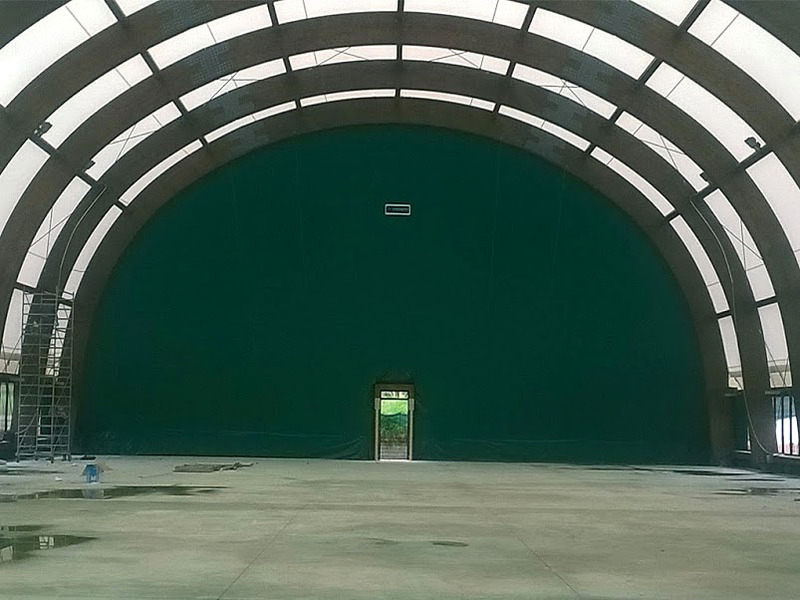 There are two types of construction: the outer and inner membranes. 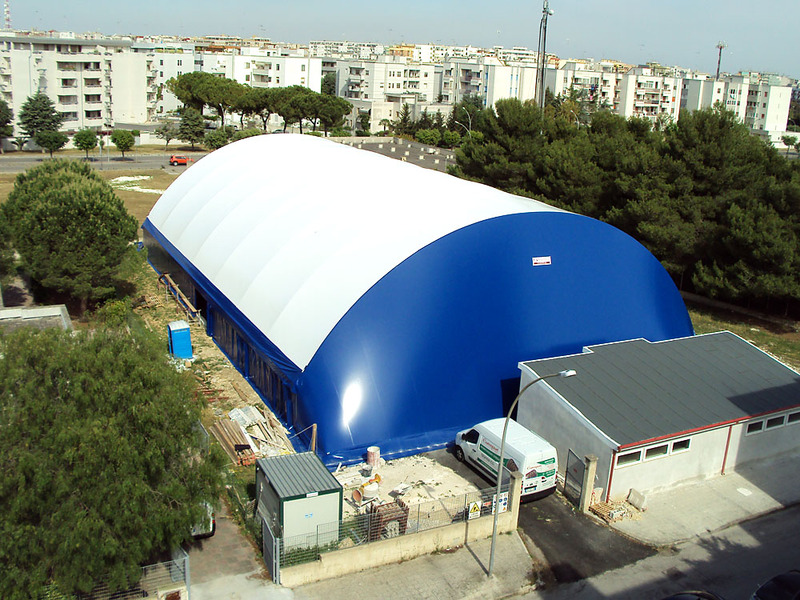 They are built in “single body” and their ventilation creates air cushions that reduce the thermal transmittance coefficient (U), remaining as “thermal bridges” at welds which, although to a minimum, adversely affect the coefficient and may produce some drops generated by the natural phenomenon of condensation; the outer membrane remains one side while the inner one is constructed “by sectors” which are mounted to the intrusion of the arches and “closed” at the height of the longitudinal quay and anchored to the head foundation. 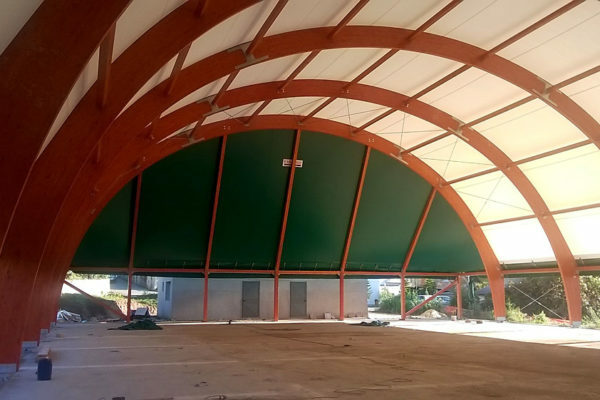 In this case there are no bridges heat and the gap is more important, the Thermal Transmission coefficient is noticeably reduced, in winter the heating costs are decreasing and the summer microclimate is less oppressive. .
All facilities are accompanied by certificates.